Find answers: Today, it’s easy to get outraged by world events, frustrated by our own personal battles, and disenfranchised from government and leadership. 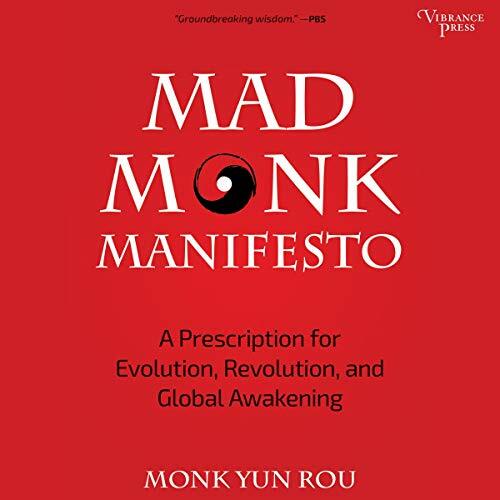 Born of moral indignation, informed by decades of study, and seasoned by a life of devoted self-cultivation, Monk Yun Rou’s Mad Monk Manifesto has the answers we’re looking for, organically cohering personal prescriptions and calls to social and political action in one powerful document. Discover venerated wisdom: Based on ancient Chinese wisdom such as Lao Tzu’s Tao Te Ching, Mad Monk Manifesto is part tour guide to consciousness, part recipe for personal development, part prescription for environmental salvation, and part handbook for social change. In approximately 70,000 words, the book’s six chapters (framed by an introduction and afterward) follow the traditional Taoist prescription for changing the larger world by changing ourselves first. Improve yourself - and the world: In the same way ripples move away from a stone dropped into a pond, Mad Monk Manifesto begins with our personal lives, discussing topics such as diet, exercise, meditation, and mind/body practice, and spreads to our public environment, describing ideas such as what we can do to improve the community, the government, and the world. Full of everything from advice for a healthy, conscious lifestyle to suggested actions we can take to enhance the lives of friends, family, coworkers, and community members, Mad Monk Manifesto highlights spirituality and service, the goals of an awakened life. Learn something new: Each chapter of Mad Monk Manifesto is creative and fresh, offering proactive solutions in single-paragraph exhortations and prescriptions against a backdrop of lessons from Chinese history, the wisdom of ancient sages like Lao Tzu, and stories born of author Monk Yun Rou's journey from privileged Manhattanite to practicing Taoist monk. Inspirational and informative, exhortative and prescriptive, this modern Alan Watts creates a complete and immersive experience for everyone who picks up his Mad Monk Manifesto - a portrayal of everything from the mundane to the sublime through the lens of the philosophy best known from George Lucas’ Star Wars saga, the Green Movement, and surf and hippie cultures. Emerge with a new way of seeing life, a series of concrete steps to take for personal transformation, and an action plan for working in the community to provoke change. Mad Monk Manifesto is what the world needs at a time of unprecedented environmental disasters, international instability, and divisive leadership. You will learn how to relax, rectify, and rebalance life; how to bolster the community and deepen culture; and how to effect positive change in commerce, government, power, and the environment.